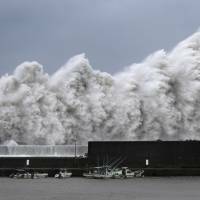 Typhoon Jebi — the most powerful typhoon to hit Japan in 25 years — slammed into the western part of the country on Tuesday, killing at least seven and injuring more than 200, disrupting transportation, heavily damaging the bridge that leads to Kansai International Airport and leading authorities to call for evacuations of areas in its path. 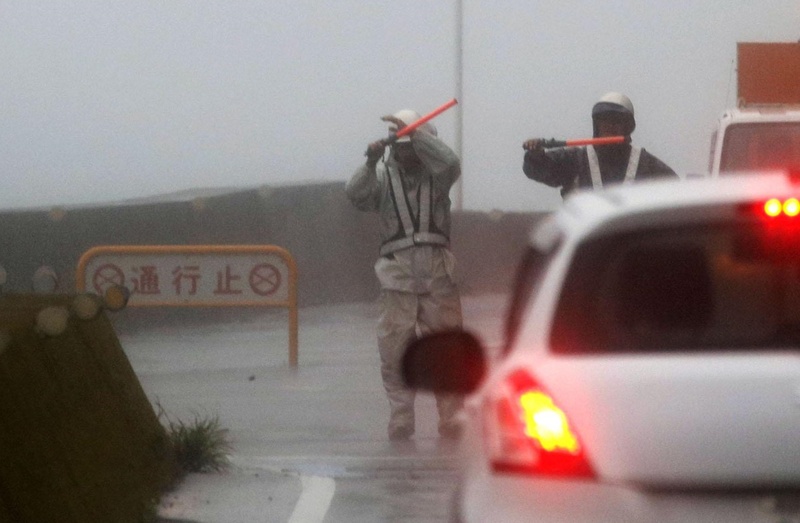 The Meteorological Agency warned of heavy rains, strong winds and mudslides across the western and northeastern regions of the country as the typhoon first made landfall in the southern part of Tokushima Prefecture around noon. The storm made landfall again around 2 p.m. near Kobe. As of 10 p.m. Tuesday, Jebi was traveling north-northeast over the Sea of Japan north of Niigata Prefecture at a speed of 70 kilometers per hour and with an atmospheric pressure of 975 hectopascals at its center. In Higashiomi, Shiga Prefecture, one man was killed when a company storage facility collapsed amid strong winds. 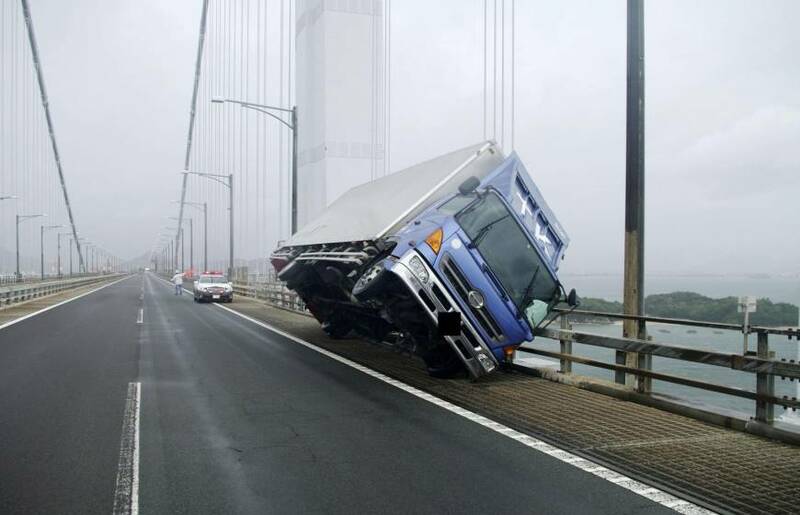 Powerful gusts in the prefecture also tipped over several trucks on the Meishin Expressway. Another man died after falling from the second floor of his home in Sakai, Osaka Prefecture. Near Kansai International Airport, strong winds swept away a tanker berthed in Osaka Bay, slamming it into the sole bridge that connects the airport to the mainland and taking a large chunk out of the bridge. None of the 11 crew members were injured, the regional coast guard headquarters said. Heavy flooding prompted the Transport Ministry to close down the entire airport, which is built on reclaimed land. According to the airport operators, 5,000 were stranded at the facility as of 10:30 p.m. Tuesday. Flight operations may resume Wednesday evening at the earliest, the operator said. 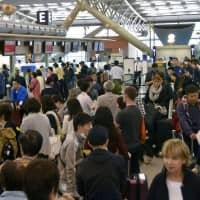 All Nippon Airways canceled more than 320 domestic and international flights, and Japan Airlines more than 270 flights on Tuesday, affecting around 57,000 passengers in total. 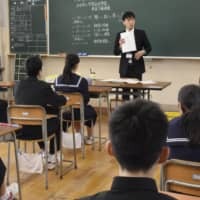 Power was out at 1.61 million houses in Fukui, Shiga, Kyoto, Osaka, Hyogo, Nara and Wakayama Prefectures on Tuesday, in addition to 95,000 houses in the Shikoku region. Dramatic footage taken by a bystander also showed parts of the roof of the newly remodeled Hotel Hewitt Koshien — near Koshien Station in Nishinomiya, Hyogo Prefecture — blowing off and into an electricity poll amid strong winds from the typhoon. The hotel is adjacent to the iconic Koshien Stadium. 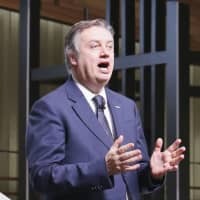 In the city of Osaka, Tatsuki Okada, a desk manager at the Hyatt Regency Osaka, said he was urging visitors to take precautions amid the storm. “The winds are quite strong and we’re advising our customers and guests not to get too close to glass windows and walls,” he said. Meanwhile, more than 330,000 homes in the Kinki and Shikoku regions suffered power outages. Evacuation orders were earlier issued in some areas of Osaka, Kyoto, Nara, Hyogo, Kagawa, Ehime and Wakayama prefectures. In Japan, evacuation orders are not mandatory and people often stay at home, only to be trapped by rapidly rising water or sudden landslides. 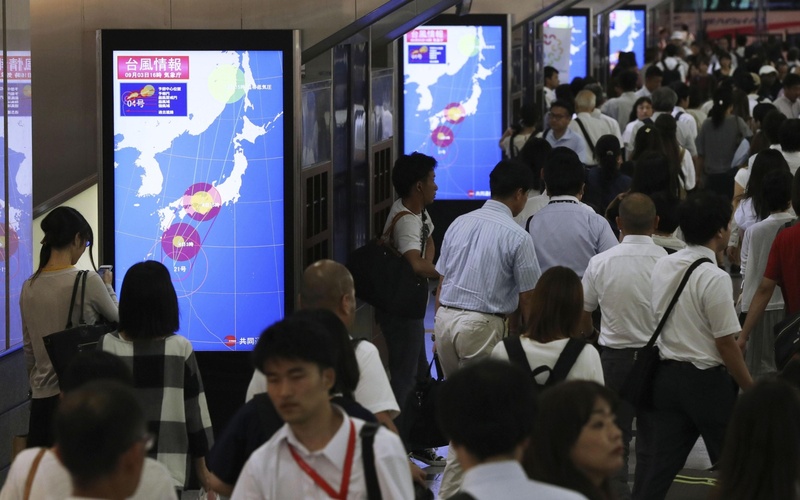 Top government spokesman Yoshihide Suga had encouraged the public to “evacuate early” and said at a news conference Tuesday morning that the government will “take all possible means” to prepare for a possible crisis. Prime Minister Shinzo Abe, who has been traveling across the country in an attempt to secure support for his bid for the ruling Liberal Democratic Party’s presidential election later this month, canceled his trip to the Kyushu region to deal with the typhoon. Abe had faced criticism over his initial response to heavy rain that pounded western Japan in July, given that he and some other ministers were found to have been drinking at a gathering of LDP lawmakers in Tokyo as the situation became increasingly grim. 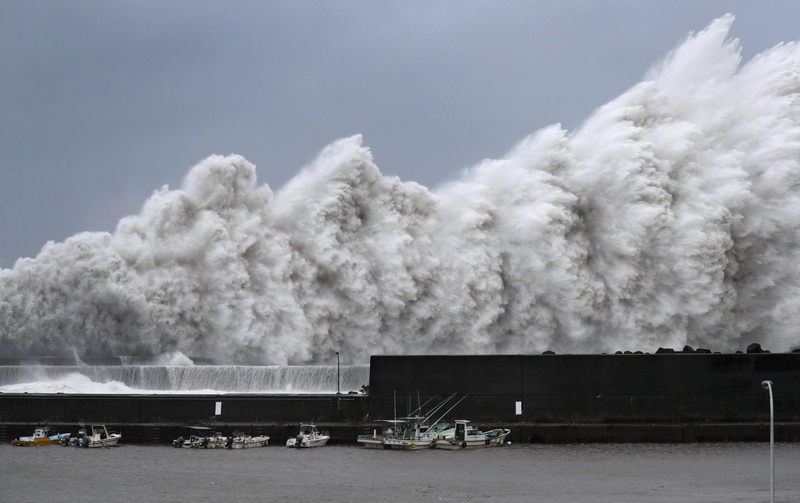 Japan has been hit by a succession of typhoons and disasters related to heavy rain, including massive flooding and landslides that left more than 220 people dead in July. The Meteorological Agency had projected that Typhoon Jebi would move northward along the Tohoku region’s Sea of Japan coast, weakening to an extratropical cyclone by Wednesday morning. 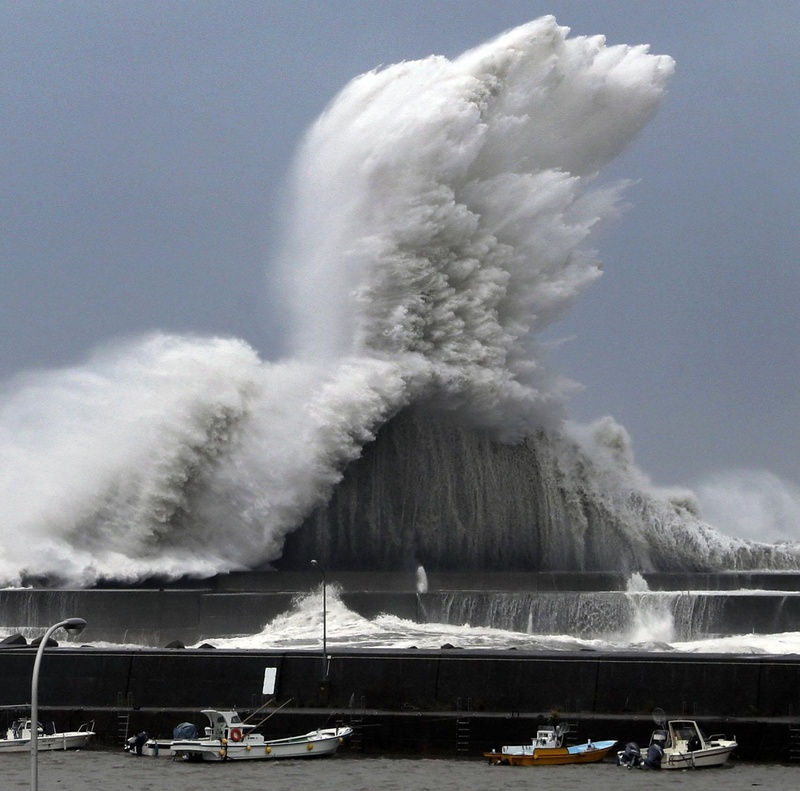 In Tokushima Prefecture, wind and rain strengthened after it made landfall. A 67-year-old man in the town of Itano hit his back after falling over while trying to cover the roof of his house with a sheet. Another man in his 60s fell two meters into a rice paddy in the city of Mima. Bracing for Jebi, domestic airlines have played it safe, canceling hundreds of local and international flights mainly scheduled to depart and arrive in airports in western and central Japan. Railway operators also halted some services, including on the Tokaido Shinkansen and Sanyo Shinkansen lines. Some expressway sections were also expected to be closed off. Many bullet train passengers bound for the Kansai area were stranded on halted trains. 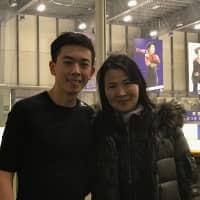 Among them was Indonesian national Justin Setiawan, 25, and his family, who were on their way to Osaka aboard the Nozomi 29 train for a vacation. “We have been stuck approximately 3.5 hours,” he said in an email sent to The Japan Times. Setiawan said that despite the scenario, the passengers remained quite calm, but that all the food and bottled water onboard had already run out. Setiawan also was sanguine about the events. 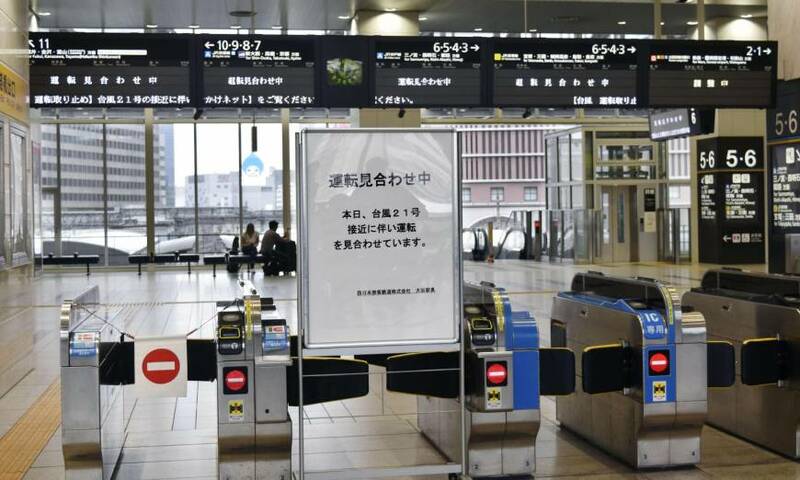 Hiroki Nakaya, a 21-year-old university student who was traveling to the Kansai region from Kanagawa Prefecture, said at Osaka Station that the storm had prompted him to consider changing his travel plans. “I heard on the news that JR lines would stop. I was planning to go to Kyoto, but I’m not yet able to make up my mind,” he said. Department stores and popular tourist attractions in western Japan, including Osaka and Kyoto prefectures, also fell victim to the typhoon, with many closing for the day. USJ Co., the operator of Universal Studios Japan in Osaka, closed its park and few people were seen in the usually bustling surrounding areas. The typhoon also affected factory operations, including Suntory Holdings Ltd.’s Yamazaki Distillery in Shimamoto, Osaka Prefecture. In Kyoto, the Kyoto City Zoo, the Kyoto Aquarium, and Nijo Castle were closed. “We’re not sure yet if we’ll be open on Wednesday. It depends on the typhoon. 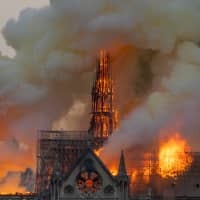 But for the safety of our visitors, we decided to close today,” Hiromi Kamiguchi, a spokeswoman for Nijo Castle, a UNESCO world heritage site, said Tuesday morning. Also Tuesday, the Imperial Household Agency said it was not accepting visits to the Kyoto Imperial Palace and other Imperial facilities in the city due to bad weather. In the 24-hour period through 6 a.m. on Wednesday, up to 500 mm of rain was projected to fall in central Japan and up to 400 mm in the country’s west.